Any persons death is sad for us, specially someone close to our heart. Someone who knows how to live life, and gave new meaning to the human society, that man's lose was a great blow to the Malayalam fraternity, that person is non other than COCHIN HANEEFA. Cochin Haneefa was not mere an actor. He proved that he was an extraordinary talent. Whether it is story, script writing or direction, Haneef Ikka explores every field. He knows how to mould a film with his direction and then turned that into a hit cinema. But that not the fact kept Cochin Haneefa differs from others. His life spans is filled with sweetness of friendship. Love and Friendship that Haneefikka gave to Malayalam film Industry. The time when he camped at Madurashi's Uma Lodge and the time being his status as star. He never shows the negative side of his success. Always laugh and where ever he went, glow the every bit of his humbleness. He dedicated whole life to the art called "Cinema". The madness of acting gripped him when he was studying in St. Augustine School, Ernakulam. Haneefikka had the dream to become a footballer, but one time injury in the game and his father's anger, shut the doors for football. After that art become his ambition, he portrayed many characters in school anniversary and youth festivals drama. He performed his first drama called "Haidralli" and got applauds and prizes for that. Cochin Haneefa shouldered the responsibility of dramas to be staged on annual functions. 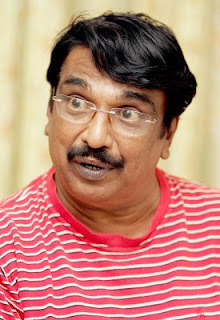 His drama plays includes "Velluthambi Dalava" and "Sivaji". Cochin Haneefa interested more in dramas rather than studies, when he join St.Aberts College for the Pre-Degree. At the college level he essayed "Othello" in the drama, which garnered him many fans including teachers. After Pre-Degree Cochin Haneefa prefers the professional course. He had relatives in Agricultural Department, looking his uncle's status, he chose Vellayani Agricultural College for further studies, but its tough to get the admission in that college. He gets the recommendation letter of MLA through his father, but all went in vain. Walking through the streets of Trivandrum, Haneefikka's eye shoots to the poster of the Shivaji Ganeshan's film called "Thiruvilayatal". Not wasting any time Haneefikka opted to see the movie, that was the start to his journey to the Cinema world. Mono act gave him the way to the cinema. Jessy was the script writer of the film "Azhimukham" directed by P.Vijayan. His closeness to the Producer and Script writer gave him chance to act in the film "Azhimukham". The role was of a rower, for the dubbing of this film, he travelled to Madurashi. His visit to Madurasi unveiled a new world of opportunities. After "Azhimukham", Cochin Haneefa didn't get another chance. On one day he saw the advertisement of "New faces" needed for the film directed by Dr.Balakrishnan, He approached the interview and got selected for the role of student leader. But when he returned to Madurashi, Cochin Haneefa came to know that the role which offered to him was replaced with someone else. Haneefikka felt very sad and depressed but Dr.Balakrishnan promised him a role for his next project that gave the courage to Haneefikka to camp at Madurashi. He shifted many lodges, at last Haneefikka shifted to Uma Lodge with his friend George in a room. Temprature of the room was too high due to the asbestos sheet he moved his Cinema journey under intense difficulties. Real Name : Saleem Ahmed Ghosh. Tamil First film - K.Balachander's "Mahanadi". Directed - "Oru Sandesham Koody", "Munu Masangalukku Mumb", "Valsalyam", "Veenameetiya Veelangukal, Bheeshmacharyar", "Aankeeliyude Tharattu", "Oru Sinduram Pottinte Orumaykyai". Tamil - "Padatha Thenikal", "Pasha Parayakal". Story - "Ithihasam", "Arambham", "Sandharbham", "Thalam Thetiya Tharattu". Produced - "Number 20 Madras Mail". Kerala state Award for Best supporting actor for the film - "Suthradharan". Total Film - over 300 films.